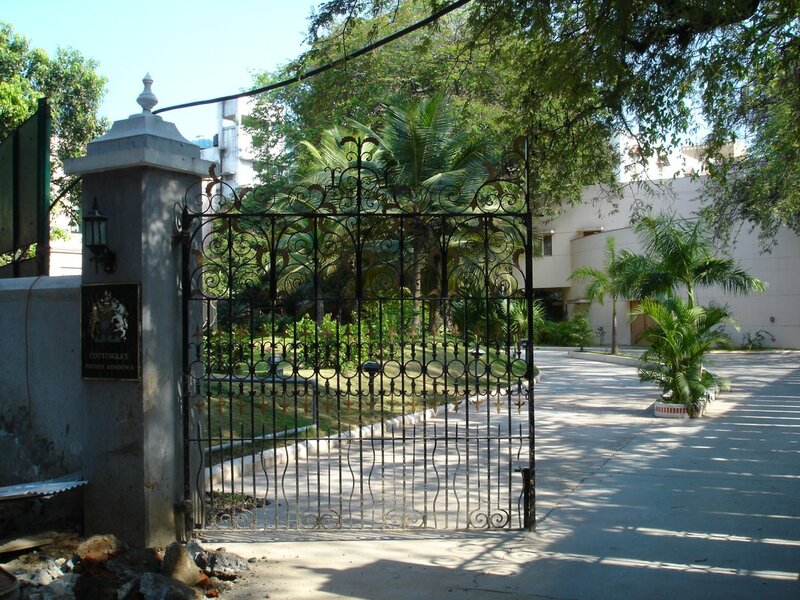 The house called Cottingley (the origin of the name is unknown) at 24 Anderson Road in Nunqambakkam, an inner suburb of Chennai, was leased for seven years immediately after Indian independence as the residence for the deputy high commissioner to southern India. At that time, the future of the post was uncertain and the lease, dated 16 November 1947, had breaks in favour of the lessee only at three and five years. The house proved satisfactory, and the post permanent, so that the lease was revised in 1949 to run until 1963. The intention in 1959 was to extend the lease to 1970 but the Ministry of Works estate surveyor who visited to negotiate this extension was surprised to find that the owner, Mr Parthasarathy Mudalier, was reluctant to sign and wanted to sell the house instead. They agreed that Rs. 270,000 (£20,250) would be a fair price but London doubted it was an economic purchase and ruled it out in 1961. The owner, however, was in financial trouble and lawyers warned the deputy high commissioner that he could be in danger of ejection. The property was put up for auction by the owner’s creditors at the very end of 1961. The Ministry of Works gave authority to bid up to the Rs. 270,000 that they had earlier vetoed. This proved sufficient, and the purchase was completed in February 1962. The land on which Cottingley stands was once part of the 110 acre orchards and gardens created by Dr James Anderson while he was surgeon-general and later physician general from 1781. 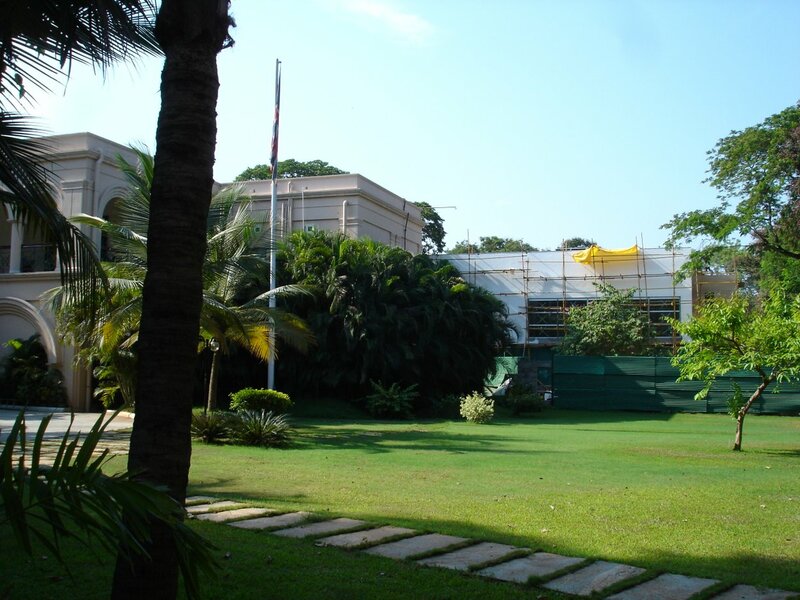 The present house was built about 1912, and is one of the best remaining ‘garden houses’ (bungalow plans with villa elevations) in Chennai. An early resident, and possibly the first owner, was F Dewsbury, the Registrar of the University of Madras. The plot was described as measuring ‘one cawnie, 22 grounds and 743 square feet, which the Ministry of Works translated to 2.57 acres. A one-storey extension to the east had been built in 1935, and the Ministry of Works added a floor to this wing in 1962 to provide two additional smallish bedrooms and bathrooms. The ornamental iron gates had formerly graced Cochin Palace, the Maharajah of Travancore’s Chennai residence. The plan of the residence is simple, with a large deep axial hall separated from dining room and drawing room on either side by open arches. 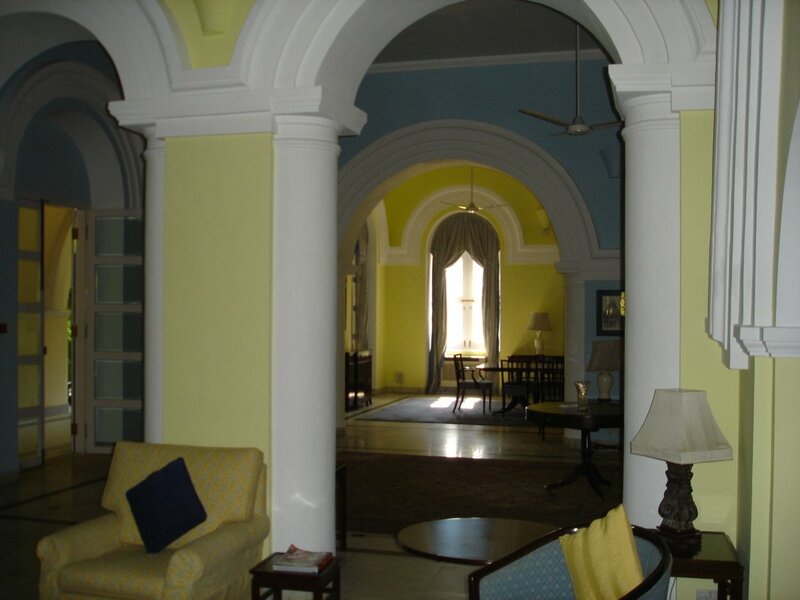 The huge bedroom above the hall was reserved, at one stage, as a pied-à-terre for the high commissioner when visiting. 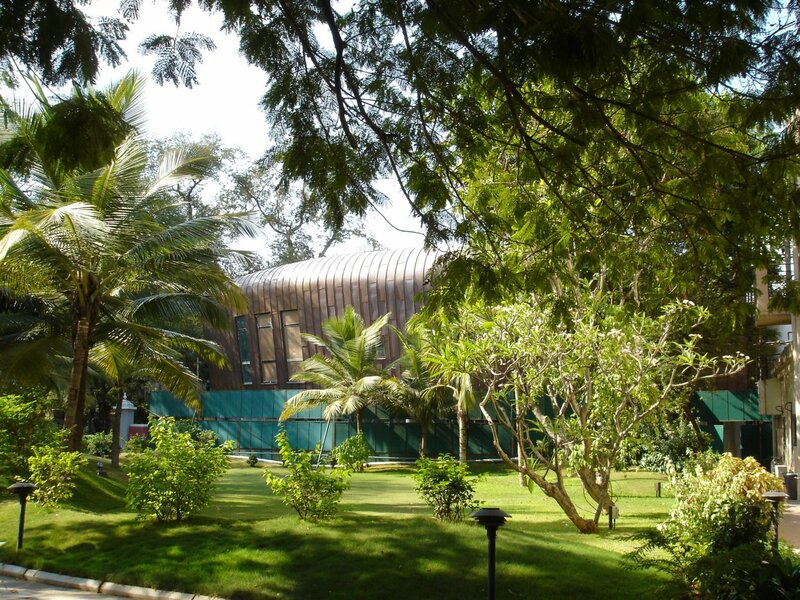 Cottingley was severely damaged by freak storms in early 1996 and, in consequence, was extensively refurbished in 1996-7 by architects CR Narayana Rao of Chennai. The garden was re-landscaped at the same time by Sujata Kohli, from Delhi. The first offices were leased in 1947 on the fourth floor of the Madras Central Library Building at 150 Mount Road. These were given up in 1980, when the Post was downgraded and the offices moved into the ground floor of the residence and the garage block in the grounds. Another small office building was erected in the grounds in 1983. With the institution of a new visa regime in 1994, temporary visa office space was leased and fitted-out in Kakani Towers, at 15 Khader Nawaz Khan Road, until a new visa office was readied in the Cottingley grounds in 1997. This building, in turn, soon became overcrowded and the smooth running of the visa operation was further hampered by intrusive and inadequate security arrangements. Architects Jordan and Bateman were commissioned to assess alternative futures for visa-issuing on and off the Cottingley site. The conclusion was to remain on site and to find a way of building new offices behind the residence without requiring the demolition of the current offices until after the occupants had moved into the new building. The architects planned and built a striking and successful building to this end, without impinging on the use of the residence (and including a swimming pool). This ensemble was completed in 2005. View across hall from drawing to dining room, 2005. 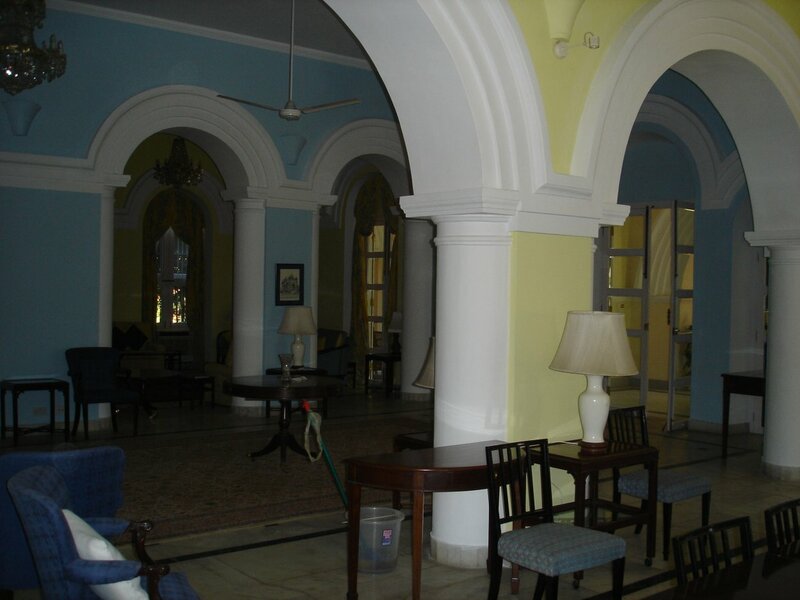 View across hall from dining to drawing room, 2005. 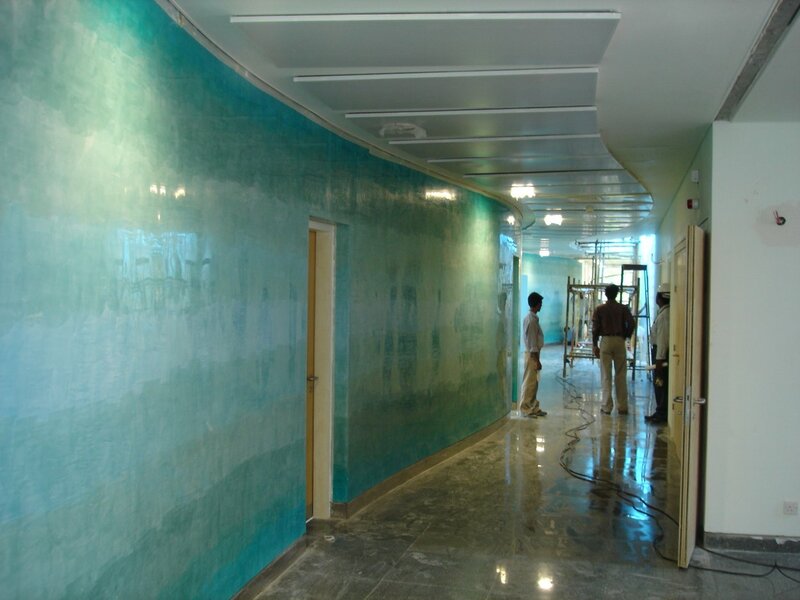 Office corridor, nearing completion, 2005. View of new offices, nearing completion, 2005. New offices, behind Cottingley, 2005.